CHRISTMAS EVE IN PRAGUE IS "SALE PENDING". PLEASE CHECK BACK LATER. 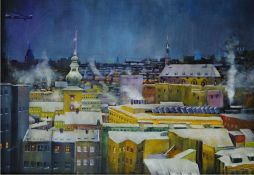 Christmas in Prague is a painting based on a photo from long ago of Prague in winter. There are a few lights in the distant streets to indicate the holidays.